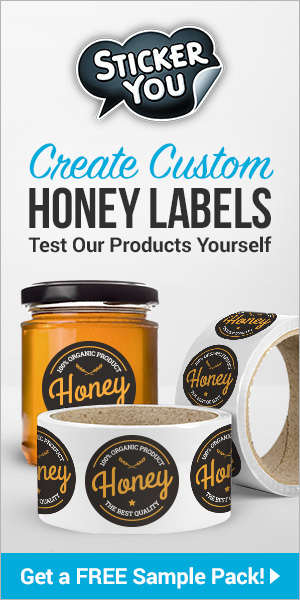 As Many Types Of Bottles As There Are Types Of Honey. This jar appears to have had a plastic slip type cap. The Bottom markings are: Design Pat 79944, 375 7 R D 1930 – 8581. 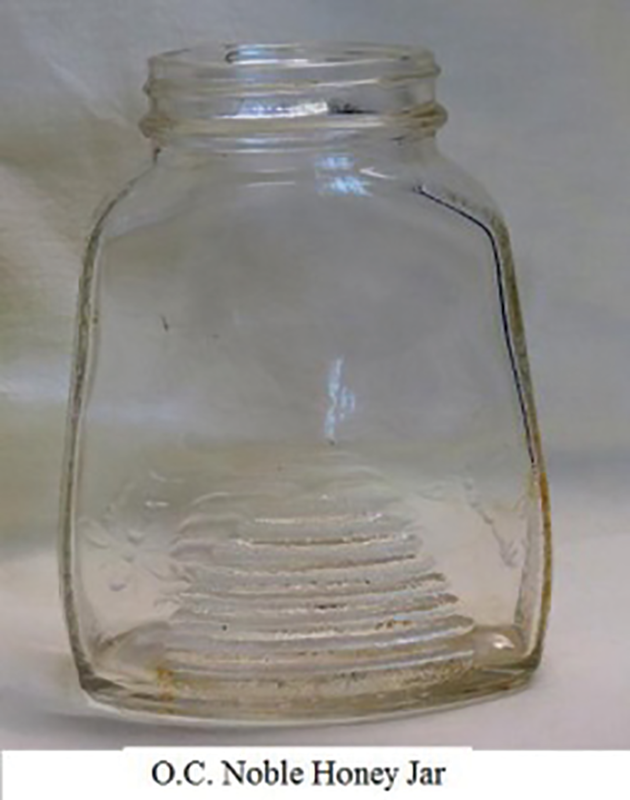 Therefore the jar was designed by Walter D. Teague in November 19, 1929 for the Turner Glass Company of Terre Haute, Indiana. No mention of it ever being a honey container. This Almond Dulce is a skin lotion that was made by The Pura Mfg. Co. of Lancaster, PA. It has a paper label and a date of June 30, 1906, but there is no list of ingredients which must have been effective later in 1906. Lynn’s Pine Cherry Tar Honey Cough Syrup Compound, Palestine, Illinois is another of the many cough syrups that only has a cherry flavoring. 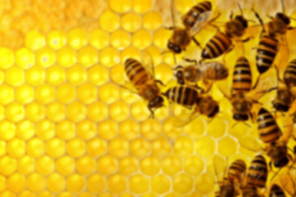 Monarch Extracted Honey was produced by Reid Murdoch and Company of Chicago, Illinois. It is an example of a one pound cylinder. The original Muth jars were made of clear or aqua glass and some lacked the background embossing. 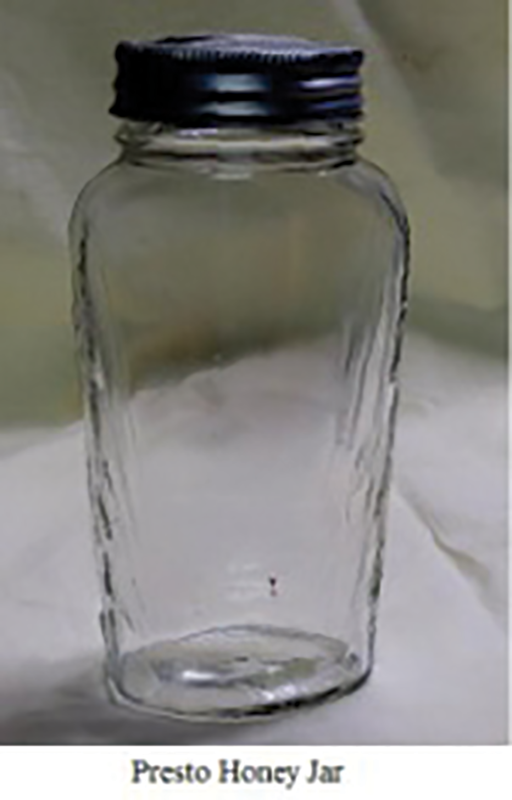 The jars were supposedly developed by Charles F. Muth of Cincinnati, Ohio about 1831. However I have found similar jars that have the names of other honey suppliers from different states. 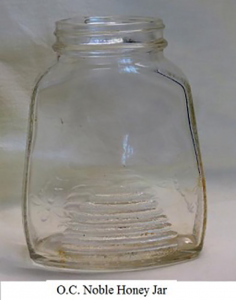 An easy way to tell if they are an original Muth jar is to look at the bottom of the jar and it should be clear or have a single letter or number. 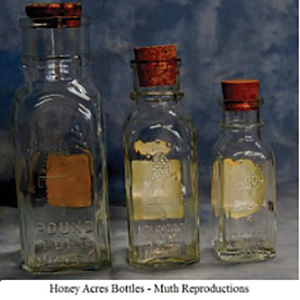 The other “original” Muth jars will have the name of the honey supplier whereas the reproduction jars will have the words “Honey Acres”. The reproduction Muth jars are made of clear glass and are available in many sizes, as 4 oz., 8 oz., and 1 lb. 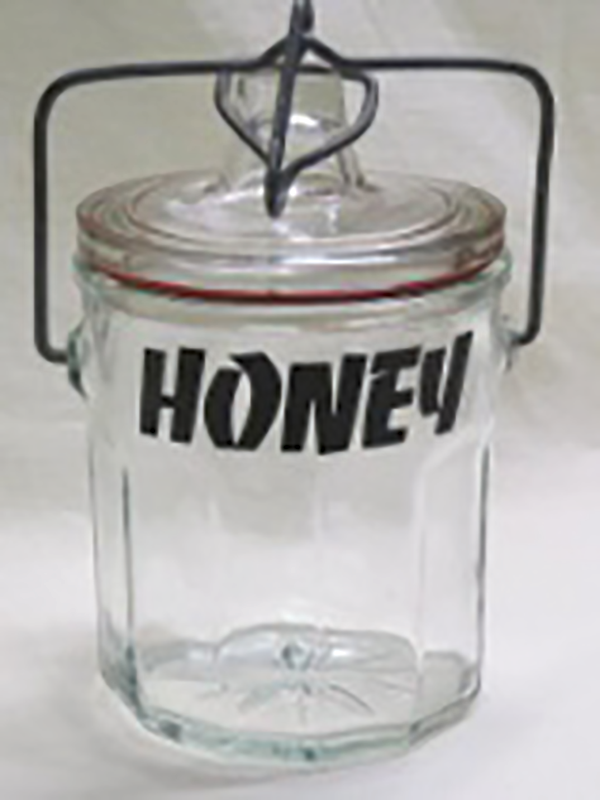 The reproduction jars are available from most bee supply dealers and make good bottles for gifts or honey sales at a special market. You have to be careful in purchasing these jars from the internet as some people will refer to them as vintage or antique and as exorbitant prices. 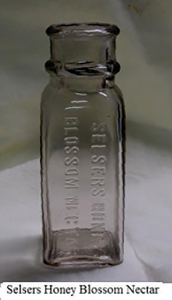 One “original” jar is embossed I.J. 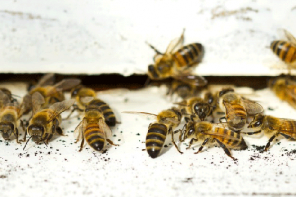 Stringham, who was a beekeeper and supplied apiarian supplies from his 105 Park Place, New York address in 1898. 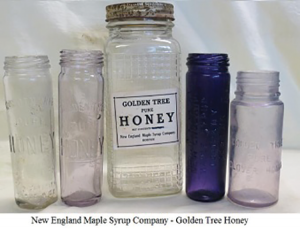 New England Maple Syrup Company or the Maine Honey & Maple Syrup Company or Boston and sometimes claiming Vermont, sold honey under the product name, Golden Tree Pure Honey. It seems that there were many different sizes of bottles and jars. 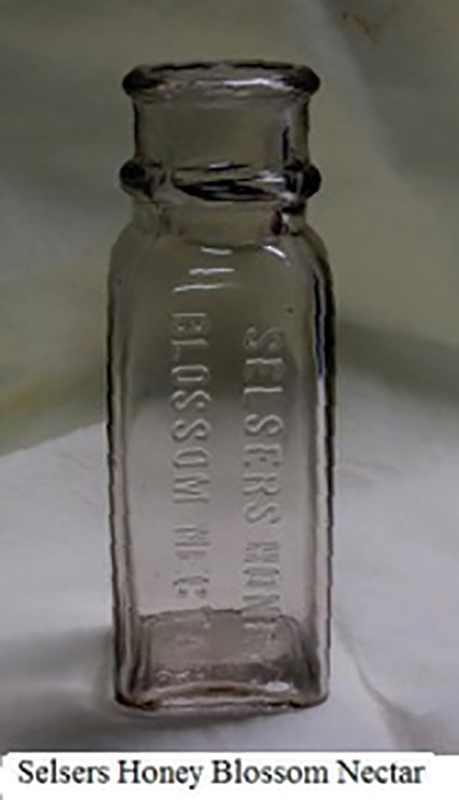 The most common bottle was 5¾” tall in clear glass but a similar cylinder was made 5-1/8” tall and wider. 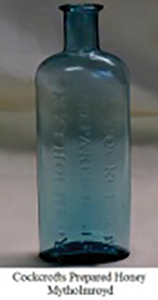 There were even small cylinder bottles that were cobalt blue in color. 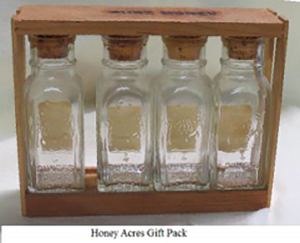 Larger quantities of honey were available in a square cross hatched Mason jars. 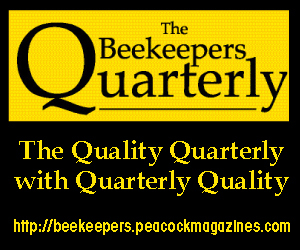 They were first mentioned in the business directory in 1904. In 1909 their trademarks were issued and they advertised up to 1920. 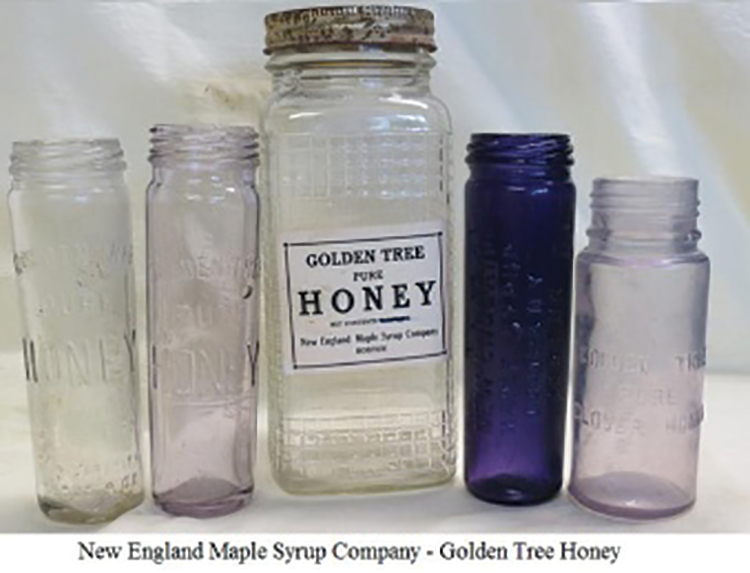 Their bottles are fairly common and contained maple syrup, honey, mustard and occasionally cane syrup. Olbert C. Noble from Washington, Pennsylvania invented a new and original ornamental design for a honey jar and received a patent for it, March 26, 1935. The patent number is Des. 94,984 and had a term of seven years. Evidently he worked for the Tygart Valley Glass Company, which was a corporation of West Virginia. A drawing of the jar is at the right. 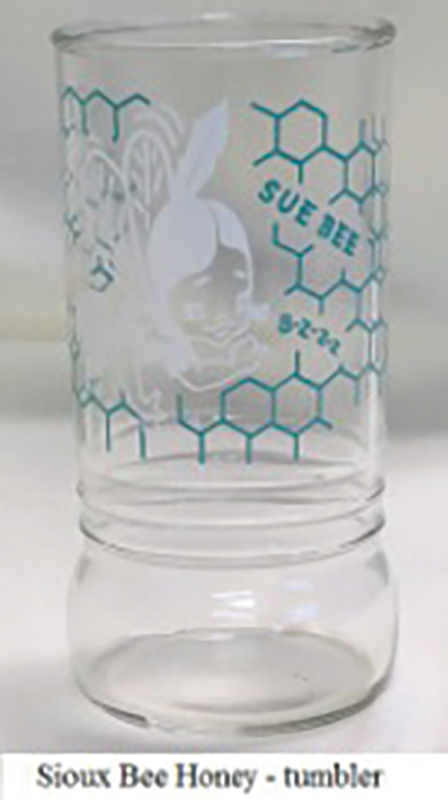 The jar is approximately 4-7/8” tall and is embossed with skeps, honey bees and honeycomb. The O-See-Bee-Gee bottle is marked W T & Co., which stands for Whitall Tatum Company of Millville, New Jersey. It was made approximately in 1904 and was used to cure coughs. The company soon became Grom. This is the time period that honey and pine tar were the main ingredients in a cough syrup. The Owens-Illinois Glass Company is known as the largest glassmaking corporation in the world. It has approximately 25 glass manufacturing locations in the U.S. and Canada. The old manufacturing mark was an “I” within a diamond. In 1954 the mark was changed to an “I” within a circle or oval. Thus the Blossomsweet honey jar processed by Finger Lakes Honey Producers Cooperative, Inc., of Croton, KY was produced in 1968. 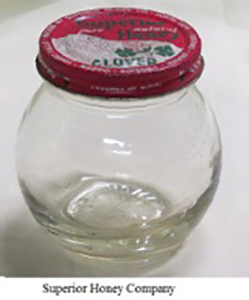 A slightly different style of jar was used by the Ann Page (A & P Finest Food stores). 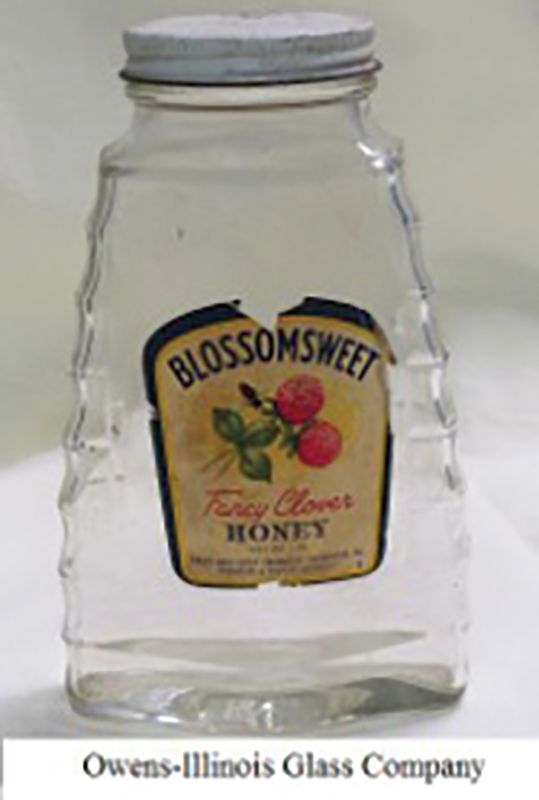 An unusual square five pound container that has an American Honey Institute lid was made in 1954. The Presto jar, number 825 – 5 is very similar to the Hazel Atlas skyline jars of 1936. 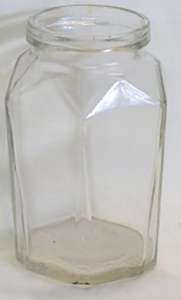 The skyline jars were available in various sizes from ½ pound to four pounds. 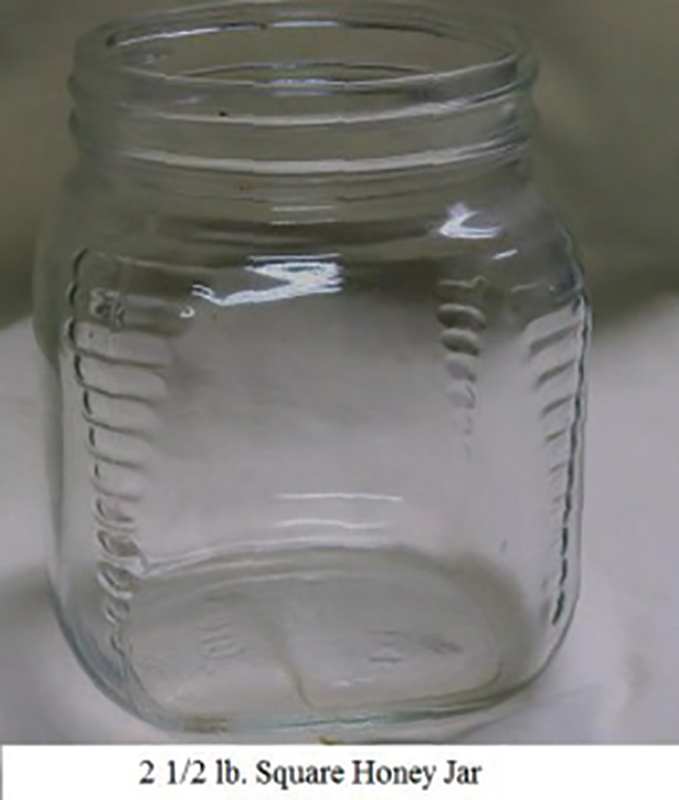 The Presto jar appears to be of the two pound size. 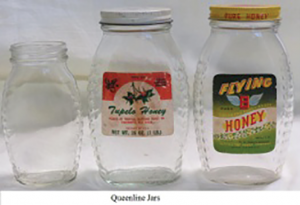 The Queenline jar was originally patented as the J.B. Smurr Jar, May 22, 1951. 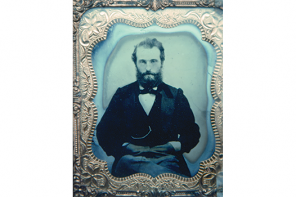 John B. Smurr lived in San Francisco, California, but evidently he had a connection with the Hazel Atlas Class Company of Wheeling, WV, who was the first company to produce the Jars. Then there were other manufactures of the Queenline jars and other jars that are similar to the Queenline jar with bands around the jar or reinforcing strips of glass for strength. 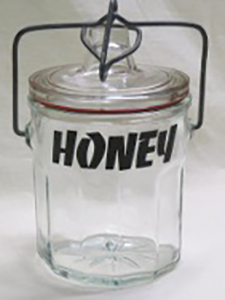 The queenline jars were one of the first jars approved for displaying honey at shows and fairs. 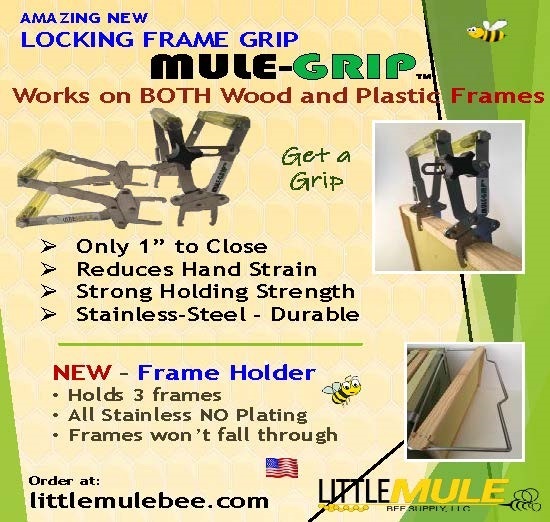 They may be available at many bee supply companies and were/are made in many weight sizes. 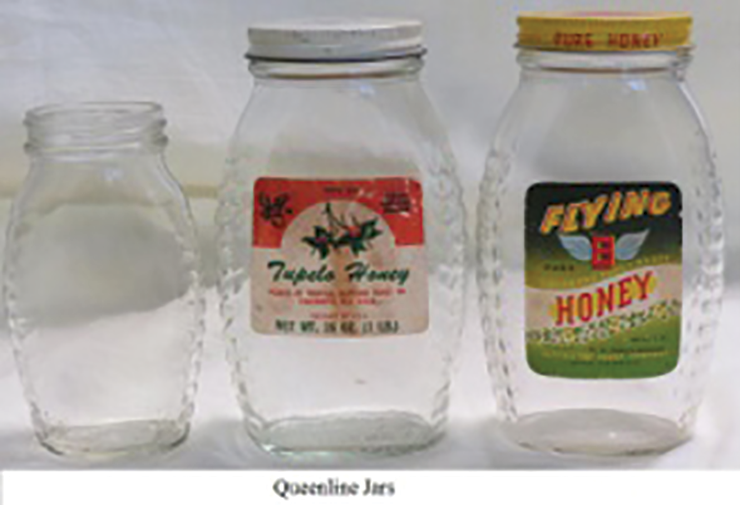 Some of the Queenline, similar type jars are grouped together: Larry M. Taylor jar patented Feb. 17, 1987 Gales Ferry, Connecticut. The Monsanto Company, St. Louis, Missouri was the assignee for Patent Number Des. 288,294. This jar has a smooth front panel for the label and ribs around the rest of the jar. This bottle came from Mytholmroyd, England which is near Hebden Bridge and Halifax. 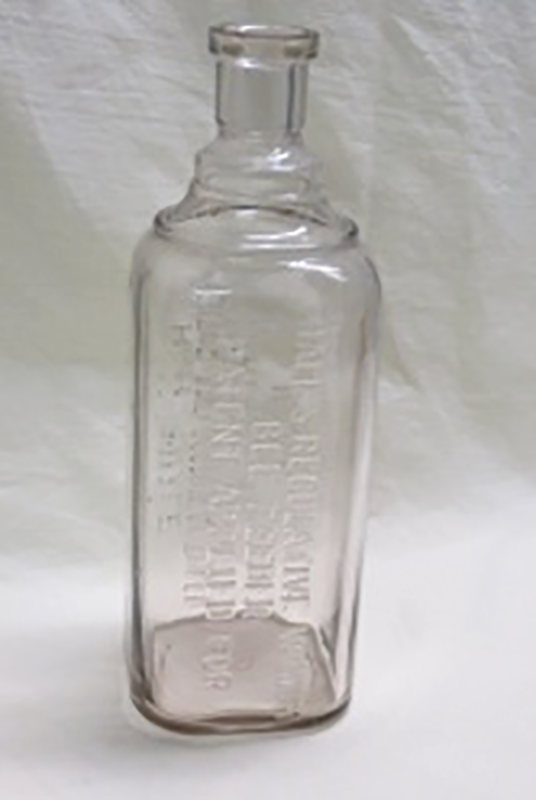 The flared lip on the bottle indicates the type of bottles made from 1830 to 1850, whereas the molding on the base was usually done between 1860 and 1870. 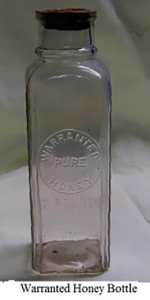 So I would estimate that this bottle was made about 1850 and was used for honey rather than hold a mixture of honey in a medicine. 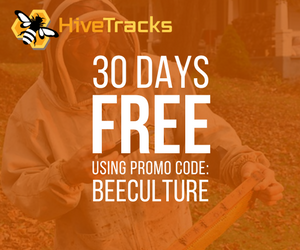 William A. Selser was the proprietor of a bee farm and a honey bottling operation in Wyncote and Philadelphia, PA area in the late 1880s. 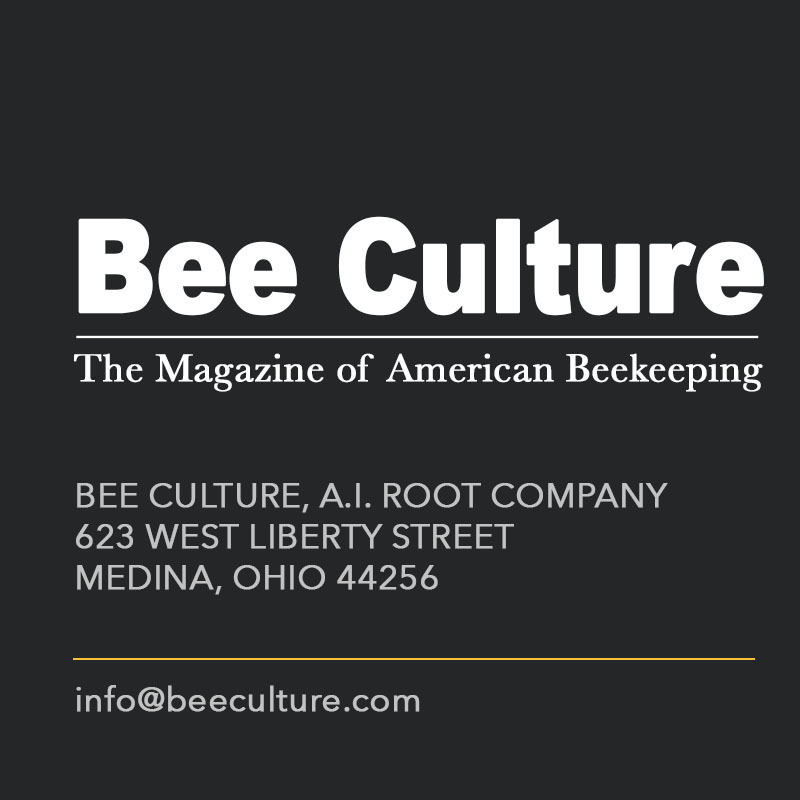 He was well known by the editor of the American Bee Journal and sold Root Bee supplies from his office at #10 Vine Street in Philadelphia. 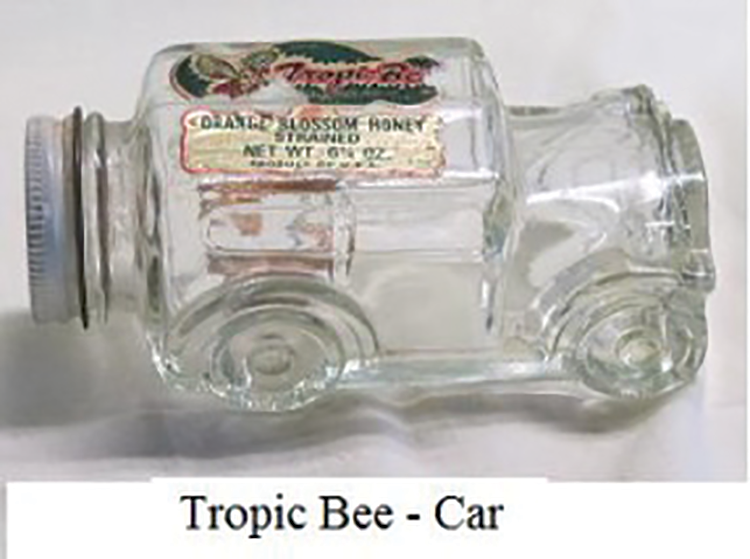 One of his first honey bottles was a hand blown “bee” bottle that is very scarce. 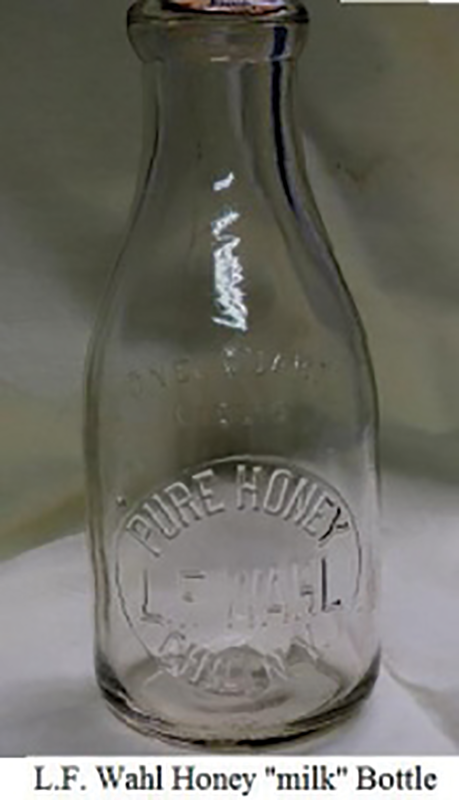 His later bottles are also hand blown cathedral type bottles which may have been the forerunners for the warranted honey bottles that Root sold and the Muth jars. I know of two versions of the one pound bottles: one is embossed Selsers Honey Blossom Nectar and the other embossed Selsers blossom nectar. 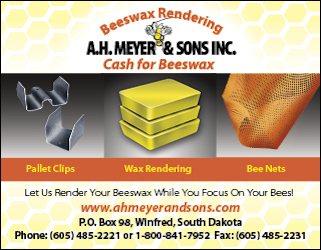 In 1921, five beekeepers in the Sioux City, Iowa joined together and started marketing honey under the “Sioux Bee” label. 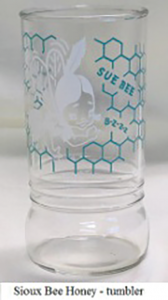 That label was replaced in 1964 with the “Sue Bee” label and the company has grown into a large association known as the Sioux Honey Association. The tumbler on display is estimated to have been marketed about 1973. 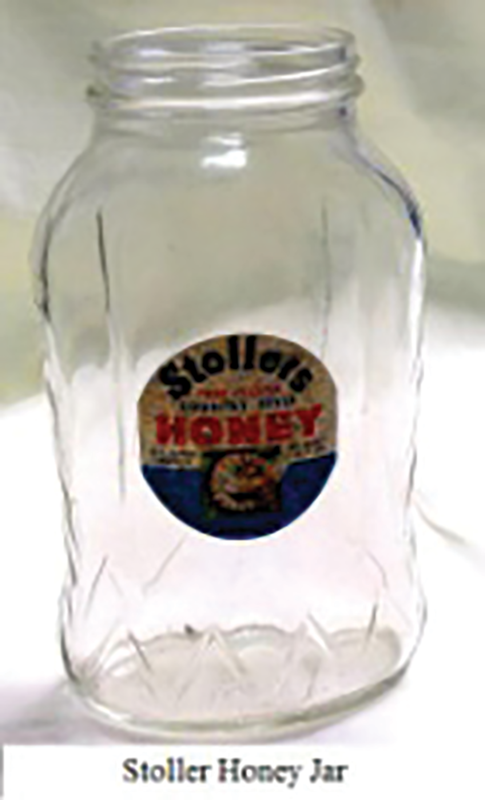 The Stoller Honey Farms, Inc. was started by Irvine Stoller in the 1920s. 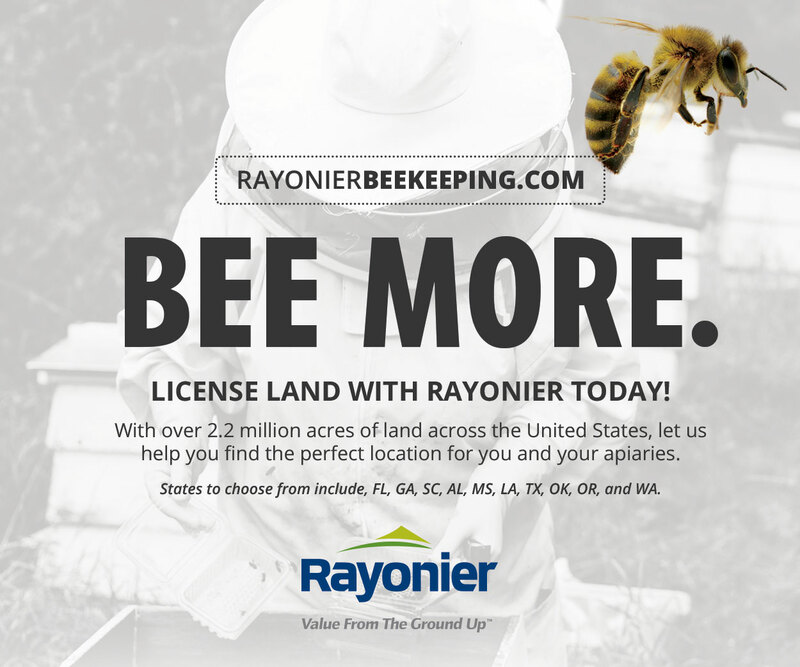 According to one reference this company was divided into two companies in 1998 to form Stoller Apiaries, Inc. and Wayne A. Stoller Honey, Inc. About 2008 the two Stoller Companies were merged with Golden Heritage Foods. 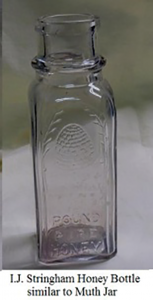 The one pound 15 ounce jar on display is from the original company and is estimated to have been sold in 1965. 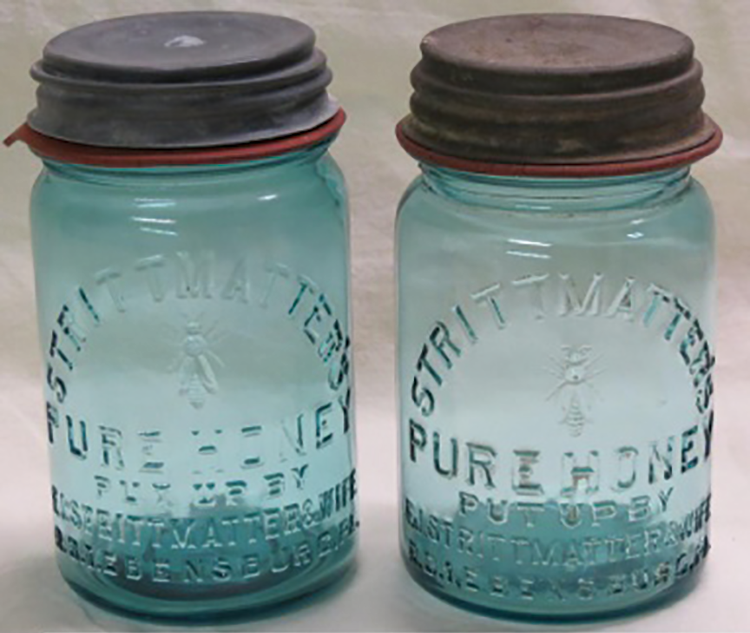 The Strittmatter & Wife jar is embossed “Strittmatter’s, (Bee), Put up by, F.J. Strittmatter & Wife, RD #1, Ebensburg, PA” and is currently valued in the $80 to $146 per jar price range. There are two different styles, and in aqua glass. They were made about 1908 to 1920. When his daughter was contacted and asked why Mr. Strittmatter didn’t list his wife’s name, the answer was because he had been married five times and didn’t want to continually be changing the glass mold. There is a difference between the two styles of jars in the height, the size of the pontil marks, and a small difference in the lettering. The taller of the two jars was made on the older Owens machine. The straight sided pickle jar, is available in 1 lb. round, 2½ pound square, and in five pound jars. They are jars that are not always specifically mentioned in the show rule books, but make excellent jars to use. 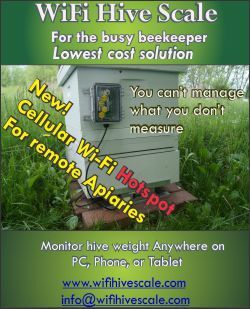 These jars are available from many bee supply dealers. 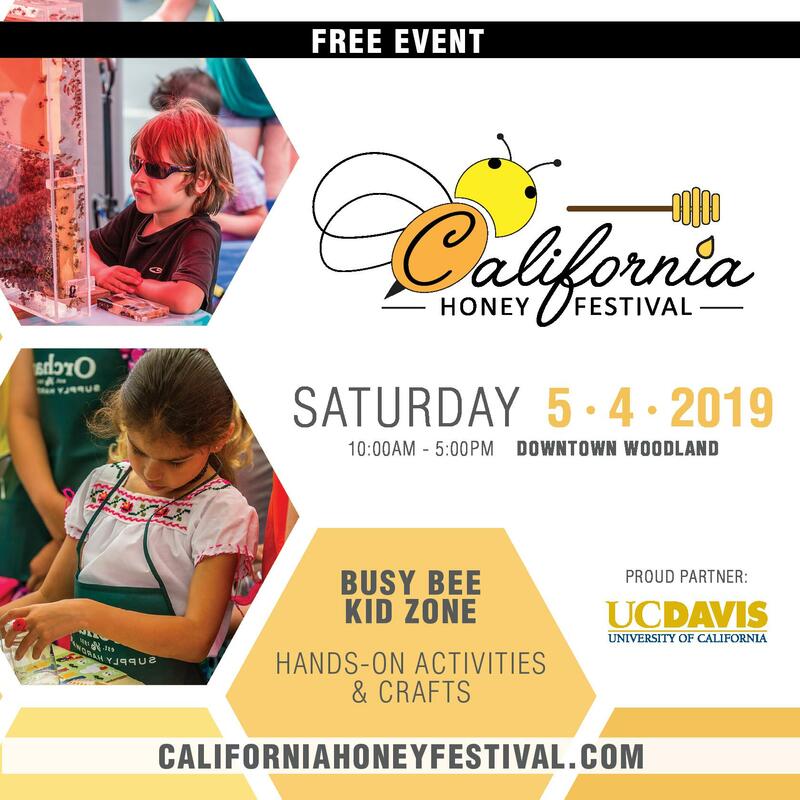 The Superior Honey Company had offices in six different locations in South Gate, Fresno, Denver, Phoenix, Ogden, and Idaho Falls. The Swindell Bros. maker’s mark was an S in a circle. 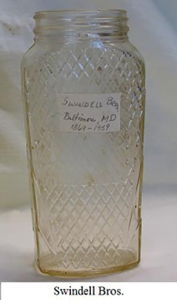 Swindell Bros. of Baltimore, Maryland was in operation from 1869 to 1959. 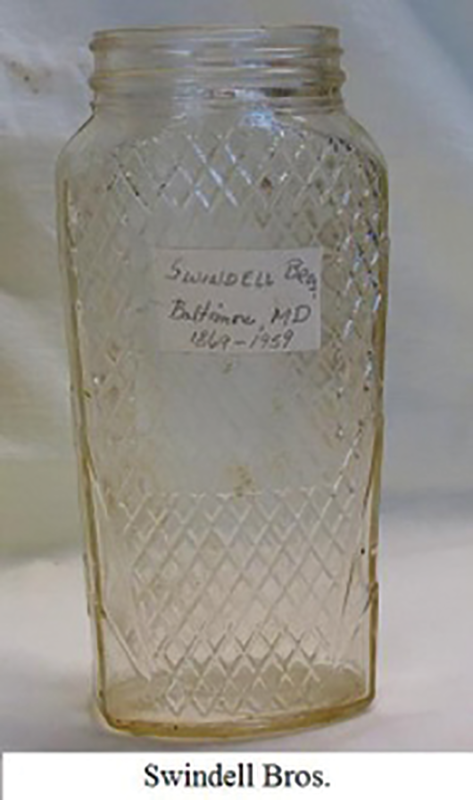 In 1873, the Swindell Bros. had a working arrangement or merger with the Anchor Hocking Glass Company of Ohio. Bottles made after 1920 were machine made. The one on display is estimated to have been made in 1940. The markings on the bottom are S-216 within the circle and 10 on the outside. The sides of the jar are decorated with cross hatching. 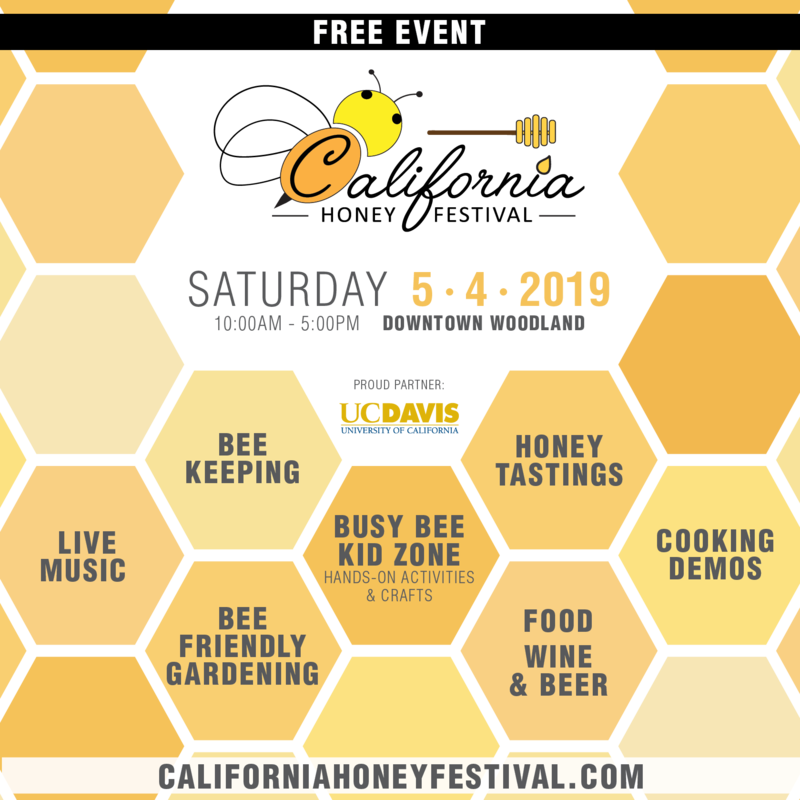 Tropical Blossom Honey Company, Inc. 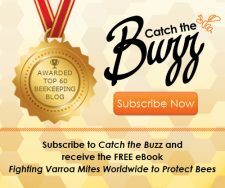 The Tropic Bee is one of the trademarks of the Tropical Blossom Honey Company uses. 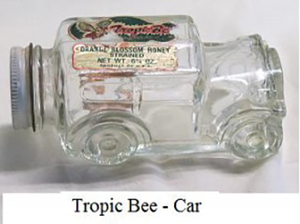 One of their marketing strategies is to use unusual honey containers and you will notice a container that looks like an automobile. David K. and Helen McGinnis founded the company in 1940 and sell unique Florida honeys such as Orange Blossom, Tupelo, Palmetto, and Tangelo. 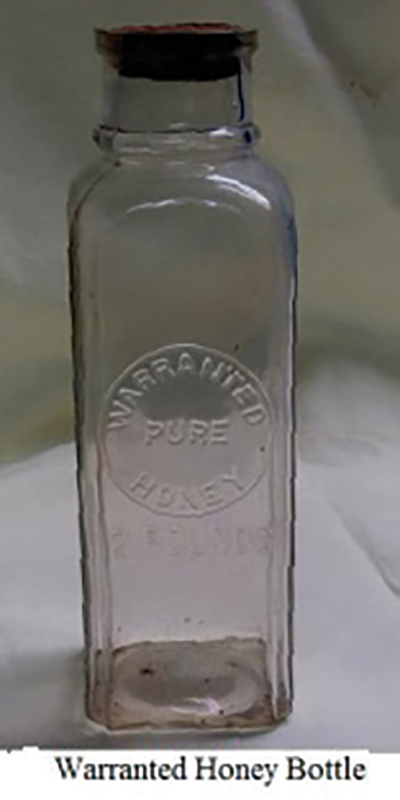 The Warranted Pure Honey Jar was the type of jar that was sold by the A.I. Root Company in the 1890s. 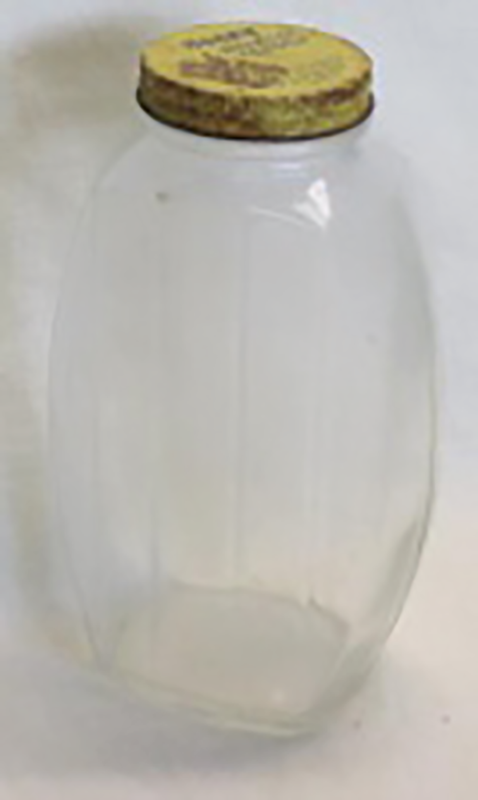 It is similar to the Muth jars without the decorative embossing. 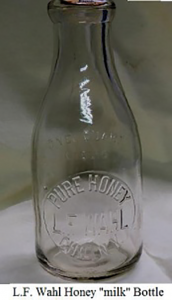 L.F. Wahl, Chili, N.Y. sold honey in quarts, pints, and half pint bottles. A close examination shows MTC which were makers of the bottle Thatcher Glass Manufacturing Company. These bottles were made from 1923 to about 1949. 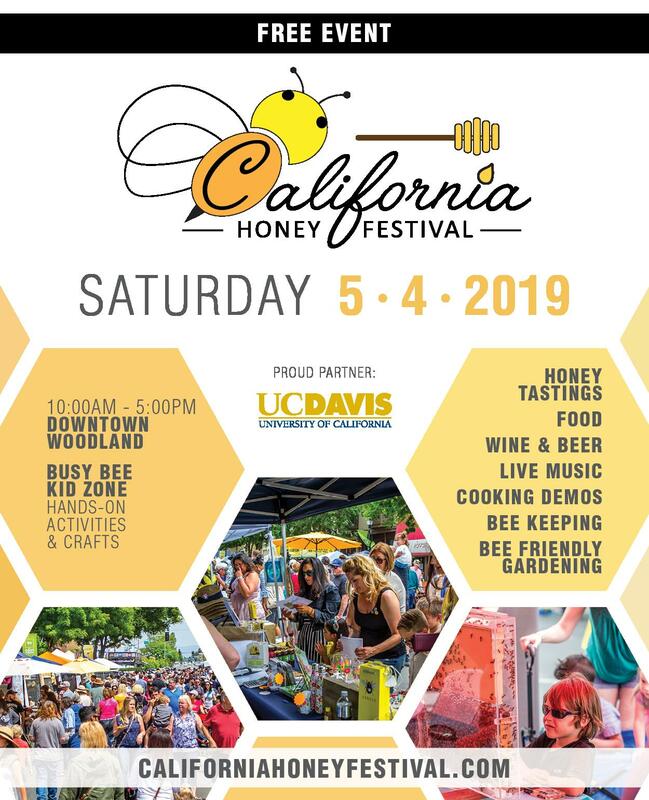 Notice that this bottle lists honey as the contents and not like the regular milk bottles that list their names as honey gardens or show bees, skeps, or flowers. The P.N Townsend bottle is listed here as they ran both a honey business and a dairy and used the same bottle. 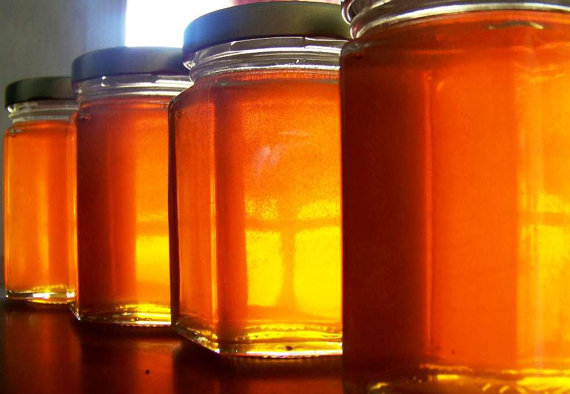 In 1927 Meharry of San Francisco, California sold honey in pint, half pint, and ¼ pint jars. Premium Dairy has a nice Eagle and Skep embossed in their crest on the bottle, but the emphasis is on milk. 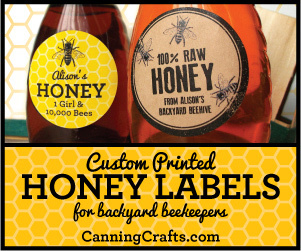 Consequently it will be listed with bottles that look like honey bottles. Walkers Honey Whip is really an example of finely granulated honey in a one pound container. 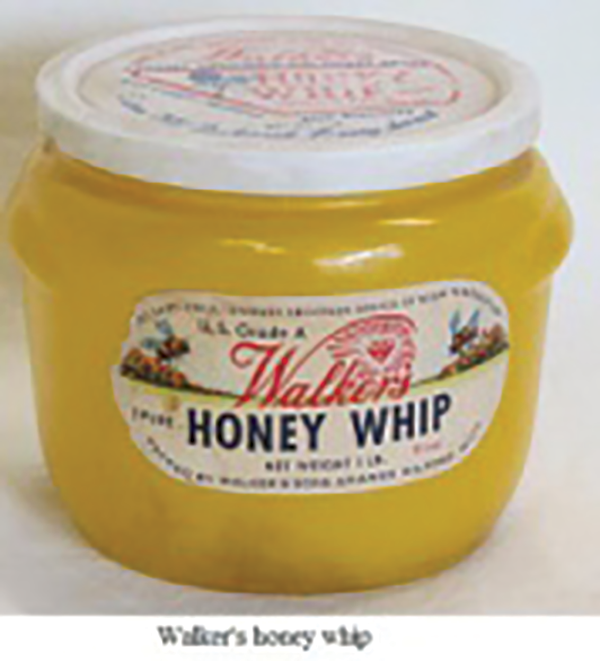 It was produced by Walker & Sons Apiaries in Milford, Michigan in 1948. 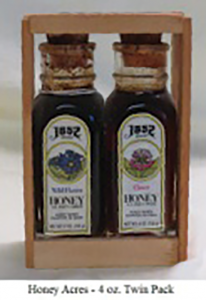 The White Clover Honey Company was in Reading, Pennsylvania and produced a bottle similar to a soda bottle. Due to the formation of the top lip, it appears to have been made between 1865 and 1880. The bottom doesn’t have a pontil mark and it indicates that it was hand blown into a mold. 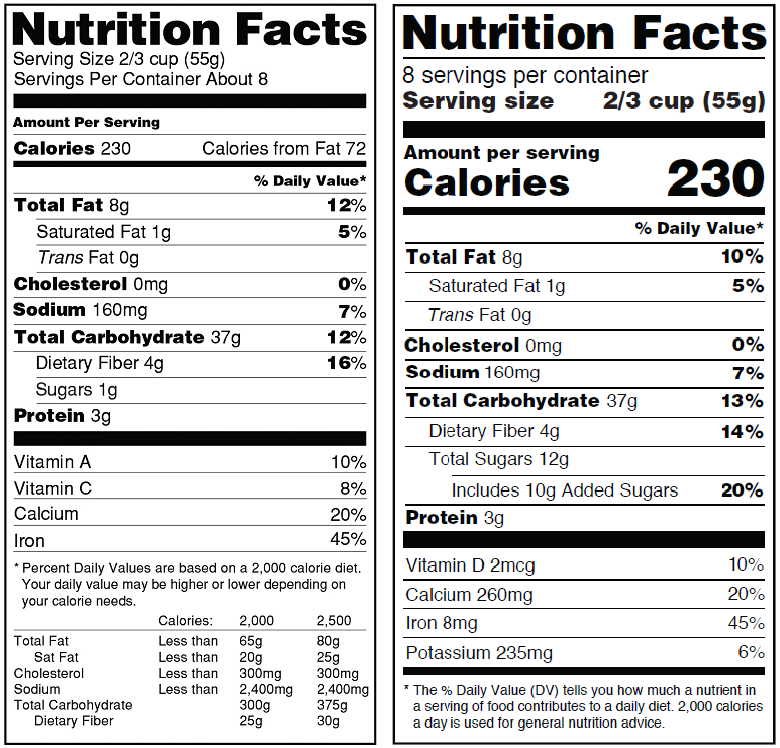 CATCH THE BUZZ – New Food Nutrition Labels Change The Message. The food industry has two years to comply.